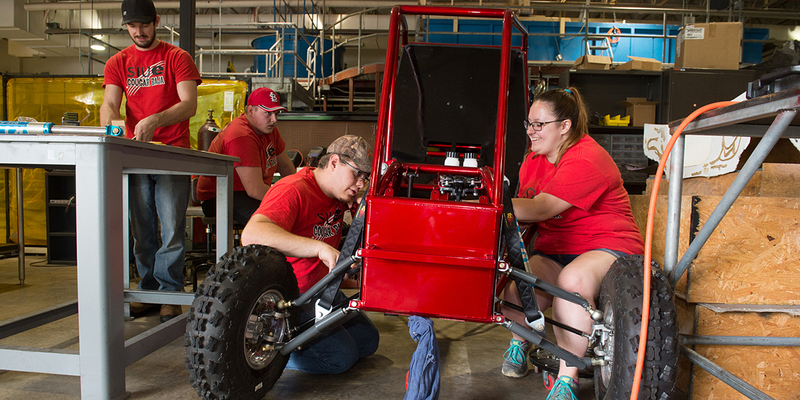 Cougar Baja attended their final trip this year to their only SAE competition in Cookeville Tennessee. There are three SAE events a year, one in the Midwest, one on the west coast, and one on the east cost. These events are sponsored by the Society of Automotive Engineers and host 100 teams, and this year over 20% of those teams were international. The event was suppose to be four days long and include a sales presentation where you make your product (baja car) marketable, a design presentation to talk about and explain the engineering decisions you made during the design to engineers from large automotive engineering companies, a series of dynamic events which tested pulling ability, maneuverability, and suspension testing, and a 4 hour long endurance race the last day. Unfortunately due to incoming bad weather the last day, they compressed the events on Saturday and Sunday to avoid the storm. The team had a few highlights on the trip which included passing tech and bake check on the first try while many other teams were struggling with one of the two. In the maneuverability competition we placed 15th out of 96 teams. In the endurance race according to the live stream we were on track to place in the teens, which would have been our best placement ever for our team but an hour before the race was over our gearbox broke. We were forced to watch the last hour of the race and ended up with 40th, still well within the top half.